I love that this plays out in real time, that the characters try to be as freewheeling as they were nine years earlier, but they can't because they are weighed down by time and life. I like seeing the age on their faces and in their stories. I love how they slowly open up to each other and how prickly both characters can be - on this latest rewatch, I was less enamoured with their younger versions in Sunrise, and realised they can both be pretty unsympathetic at times. Gosh, this is just a beautiful 80 minutes of film. I rewatched all three of these films recently and this one remains my favourite, even though I love them all. I think this manages an almost impossible feat - somehow not ruin the ending of the first film, and somehow improving on it in its own ending. 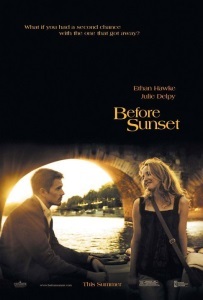 If I were to make a list of most affecting endings in film, the gap between Before Sunset in first place and the next item in the list would be kind of like the gap between those scale models of the solar system where the sun is basketball-sized but Mercury is still like a block away. "I feel like I'm running a small nursery with someone I used to date." sometimes I say this is my favorite movie of all time. it never falls lower than second or third. I actually saw it before I saw sunrise, and while it's obviously much enriched by having seen its predecessor, it manages to work beautifully as its own piece of work about two people who are both incredibly intimate and incredibly distant, trying to walk their own tightropes back to each other. without deviating from the template at all, really, it manages to be a much more adult and complicated movie than sunrise, which is lovely but much more straightforwardly romantic. the moment in the car where celine reaches out to stroke jesse's hair, but pulls back before he sees her, drops back into my brain from nowhere every once in a while. the movie is just full of rich, quiet, astounding moments like that, within and around and behind the wonderful conversations. I think Linklater's 3 "Before" films are maybe some of the best that have been made on the theme of Love - and that is in a pretty crowded market. The dialogue, the tight "24 hour format" and acting all make major contributions - but it is their scope that truly sets them apart. If we write a single romance then we only have the option of going with "one sweet memory for ever" or "they lived happily ever after" (maybe with a brief scene in which we see the characters together as old people, or something). But the only gold-standard way to flesh out the long term impact properly is to make the type of follow up we see in the "before" series. With this in mind: a shout out to French director Cédric Klapisch's series: L'auberge espagnole , Les poupées russes and Casse-tête chinois - which were shot 5 years apart and cover a group of characters. Would recommend. As somebody slightly older than Jesse and Céline, I fear that their an honest depiction of 24 hours in their life might involve several hours of dozing. And maybe some forgetting where things are. This movie holds a special place for me because of the anticipation I had to find out if Jesse and Celine had met a year later. Before Midnight was almost too real and didn't have the same romantic escapism. There's something unlikely about the first two movies: they're 90 mins of unstructured getting-to-know-you and flirting. And still it's intrigueing to watch. I guess a major part is the subtlety of Linklater, never lathering it on to thick. Although I have to admit that I didn't see the 1st movie all at once. I guess I saw it in 3 or 4 parts. Switching away when I had enough of the sniffing and circling that young people do. In the 3rd movie they're both quite bitter. Though in different ways, which makes it a bit interesting again. All in all an amazing trio of movies that shouldn't exist if the economical laws of Hollywood would have their say. Hallmark movies frequently have this same level of interest for me. A fair chunk of them involve the two just hanging out doing holiday activities and chatting and having fun.